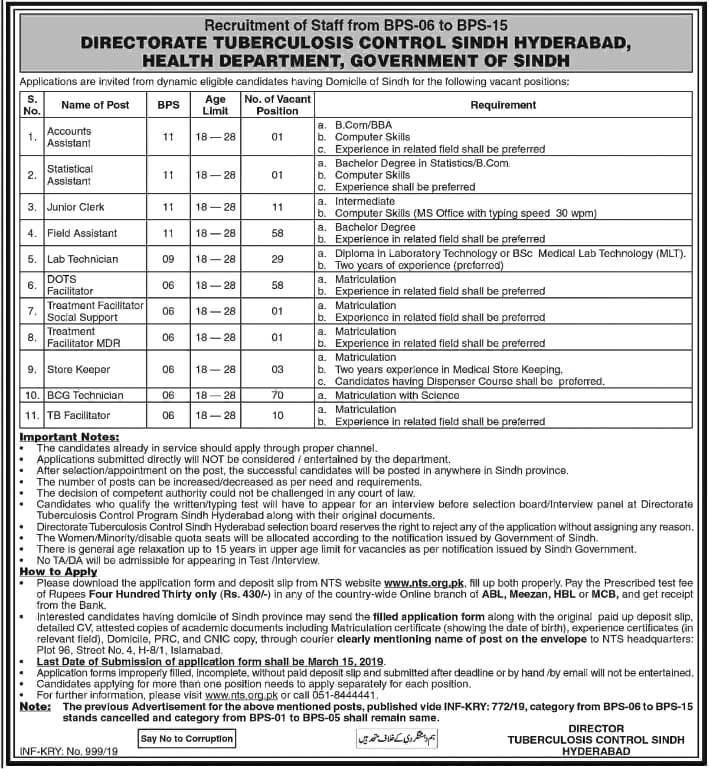 Govt of Sindh Directorate Tuberculosis Control Health Department Jobs 2019 has been announced recently, You are eligible and interested to get the jobs then you must apply within due dates. Applications are invited from dynamic eligible candidates raving Domicile of Sindh for the following vacant positions. interested candidates having domicile of Sindh province may send the filled application form along with the original paid up deposit slip. detailed CV, attested copies of academic documents including Matriculation certificate (showing the date of birth), experience certificates (in relevant field), Domicile, PRC, and CNIC copy, through courier clearly mentioning name of post on the envelope to NTS headquarters. Candidates applying for more than one position needs to apply separately for each position. Application forms Improperly filled. Incomplete. without paid deposit slip and submitted after deadline or by hand by email will not be entertained. Application Form Submission Last Date is March 15, 2019. Directorate Tuberculosis Control Sinch Hyderabad selection board reserves the right to reject any of the application without assigning any reason. The Women Minority/disable quota seats will be allocated according to the notification issued by Government of Sindh. There is general age relaxation up to 15 years in upper age limit for vacancies as per notification issued by Sindh Government. No TA/DA will be admission) for appearing In Test Interview. Applications submitted directly will NOT be considered / entertained by the department. After selection/appointment on the post, the successful candidates will be posted In anywhere in Sindh province. The number of posts can be increased/decreased as per need and requirements. The decision of competent authority could not be challenged In any court of law. Candidates who qualify the written typing test will have to appear for an interview before selection board/interview panel at Directorate Tuberculosis Control Program Sindh Hyderabad along with their original documents. Please download the application form and deposit slip NTS from from this page. fill up both properly. Pay the Prescribed test fee of Rupees Four Hundred Thirty only (Re. 430/-) in any of the country-wide Online branch of AM. Meow’, HBL or NCB, and get receipt from the Bank. NTS headquarters: Plot 96, Street No.4. H-8/1. Islamabad. Last Date of Submission of application form shall be March 15, 2019. Stands cancelled and category from BPS-01 to BPS-OS shall remain same.